The Model 930D MaxTorque™ unit is equipped with PowerFold® electric height adjustment for 3472 Series FrontMount™ DuraMax® decks. The PowerFold® feature allows operators to more easily lift the 72-inch, 541-pound deck to a near-vertical position by touching a switch. That feature provides greater accessibility to the underside of the deck for simplified maintenance and mulching-package installation, and it saves space while not in use. 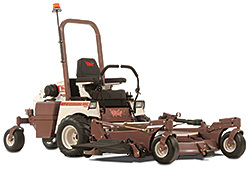 The mower features a 30-horsepower, three-cylinder, liquid-cooled Kubota engine.